Dorf on Law: "The Lawyers of Trump-Russia" Adult Coloring Book is Here! "The Lawyers of Trump-Russia" Adult Coloring Book is Here! It's here! The full-scale coloring book, a perfect way to entertain/divert yourself while we wait to find out whether we will get to read the Mueller Report! 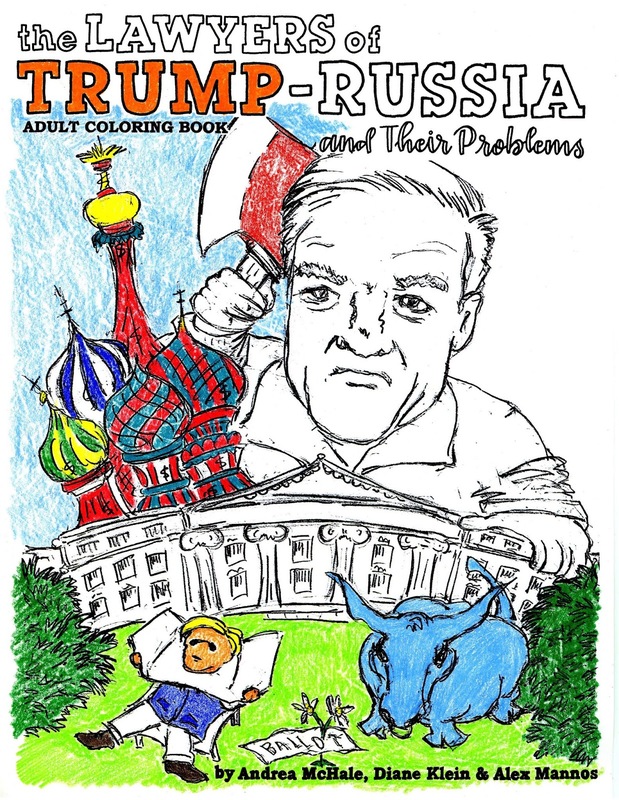 The coloring book is a light-hearted look at the Trump-Russia scandal, told in coloring book form, and focusing on the lawyers. It collects up the cartoons I've been publishing here for the past year or so, and adds more! More than 20 cartoons in all, ready for you to color, depicting the famous and not-so-famous lawyers (and their clients) involved in the scandal. It includes Robert Mueller, Donald Trump, Vladimir Putin, Mark Zuckerberg, Donald Trump, Jr., Natalia Veselnitskaya, Paul Manafort, Michael Cohen, Roger Stone, Jerome Corsi, Julian Assange, Jared Kushner, Ivanka Trump, Abbe Lowell, Michael Flynn, Robert Kelner, Neal Katyal, Bill Barr, James Comey, Jeff Session, Rod Rosenstein, Michael Avenatti, Victoria Toensing, Joe diGenova, Alexander van der Zwaan, George and Kellyanne Conway, Rudy Giuliani, Andrew Weissman, Matthew Whitaker, Don McGahn, Brett Kavanaugh, Emmet Flood, and Pat Cipollone. Enjoy! It may be difficult staying within the lines of the Coloring Book without access to the Mueller Report, especially regarding AG Barr who set the bar so high not only for collusion but especially for obstruction by Trump such that Trump could walk under it without bending or messing his coif. The spam regards some sort of cleaning company (a popular spam). Maybe AG Barr's 4-page letter to Congress on the Mueller Report needs this popular spam's services.